This article is about the 2017 model. It is not to be confused with Nokia 6 (2018). The Nokia 6 is a Nokia-branded budget smartphone running the Android operating system. It is the first smartphone from the Finnish company HMD Global,[a] created through the partial divestment of Nokia's devices division; the first Nokia-branded smartphone since the Lumia 638; and the first Nokia-branded Android smartphone since the short-lived Nokia X2 in 2014. The phone was first announced for China on 8 January 2017, with a global version announced the following month. The successor to the Nokia 6, the Nokia 6 (2018) (also known as the Nokia 6.1), was announced on January 5, 2018 in China and on February 25, 2018 for other parts of the world. The Nokia 6 features a 16:9 5.5-inch Full HD (1080x1920 pixel resolution) display. It is powered by a Qualcomm Snapdragon 430 processor and has a micro-USB port. It has a 16-megapixel rear camera and an 8-megapixel front-facing camera with autofocus. Most variants support either a single Nano-SIM and a microSD card or two Nano-SIM cards. The Nokia 6 2017 version originally shipped with Android 7.1.1 Nougat; an update to Android 7.1.2 Nougat came out in October 2017. In late January 2018, the stable version of Android 8.0 Oreo was released for the Nokia 6., By March 28 2018, the Android 8.1.0 Oreo Update came out with the March Security Patch. On February 21, 2019, the Nokia 6 received the Android 9 Pie update. 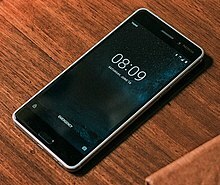 The Nokia 6 was first released in China on 20 January 2017, shortly after its announcement. Demand was high, and it was sold out within minutes after receiving over a million registrations. On 26 February 2017, at Mobile World Congress 2017, it was announced that Nokia 6 will be available globally. It was released in other Asian markets including Malaysia in 30 May 2017, and has been rolled out in Europe starting June 2017. Its launch in the United States was on 6 July 2017. It was released on Amazon.com on 12 July 2017 for a price of $199.99, containing Amazon advertisements. It was later made available through Best Buy for $229.99 at both its physical stores and online. The version sold by Best Buy does not contain Amazon advertisements. The Nokia 6 launched in India on 23 August 2017 through Amazon, priced at ₹14,999. On 10 August it was announced the device received over 1 million registrations on Amazon India. Indonesia was the last country in which the Nokia 6 was released on 14 September 2017. Following Indonesian regulations which state that mobile device hardware must have a minimum of 30% local content, the Nokia 6 is assembled in Indonesia alongside the components necessary to satisfy those regulations. The model number can be identified from the box, the introduction screen when the system boots up for the first time, and in the Settings > About Phone > Model. HAC refers to hearing aid compatibility. SS / DS refers to having a single or dual SIM slot. ^ "Nokia 6". Nokia. Retrieved 11 June 2018. ^ Liptak, Andrew (8 January 2017). "Nokia's new Android smartphone has been unveiled". Theverge.com. Retrieved 14 June 2017. ^ "CES 2017: Nokia Android phone spurns the West". Bbc.co.uk. 8 January 2017. Retrieved 14 June 2017. ^ "HMD Global launches first smartphone, the Nokia 6 in China". HMD Global. HMD Global. Retrieved 4 March 2018. ^ "Nokia 6, 5, 3 and 3310 hands-on". GSMArena.com. GSMArena.com. Retrieved 4 March 2018. ^ Anon, John. "MWC 2017: Hands-On With The Nokia 6". AndroidHeadlines. Android Headlines. Retrieved 4 March 2018. ^ Hoyle, Andrew. "Nokia 6 review: Beauty on a budget". CNET. CBS Interactive Inc. Retrieved 5 March 2018. ^ Real, Mark. "Nokia 6 Now Receiving Android 7.1.2, October Security Patch". AndroidHeadlines. Android Headlines. Retrieved 24 March 2018. ^ Cragg, Oliver. "HMD Global kicks off Android 8.0 Oreo rollout for Nokia 6 and Nokia 5". Android Authority. Android Authority. ^ Jonnalagadda, Harish. "Stable Oreo update is now rolling out to the Nokia 5 and Nokia 6". Android Central. Mobile Nations. ^ "New Nokia smartphone sold out in a minute after release in China". RT International. ^ Palmer, Jordan (26 February 2017). "Nokia takes the wraps off of the Nokia 5, 3, and 3310, also announces global availability of the Nokia 6 and more". Android Police. Retrieved 19 June 2017. ^ "Nokia 6, 5, and 3 To Be Launched In Malaysia On 30 May - Lowyat.NET". www.lowyat.net. Retrieved 2017-08-20. ^ "Nokia 6, Nokia 5 and Nokia 3 now have UK prices and release dates". TechRadar. Retrieved 2017-08-20. ^ "Nokia 3, 5, 6 & 3310 release timelines in Europe, APAC, UK and India". Nokiapoweruser. 2017-04-16. Retrieved 2017-08-20. ^ Miller, Paul (11 July 2017). "Nokia 6 is now available on Amazon for $179.99 if you love lock screen ads". The Verge. ^ "Nokia 6 available online and in stores at Best Buy for $229". Android Central. 31 October 2017. ^ "Nokia 6, 5 and 3 launched in India: Price, specs and availability". The Economic Times. 13 June 2017. Retrieved 14 June 2017. ^ "HMD Global launches Nokia 3, 5, and 6 in India". Android Police. 13 June 2017. Retrieved 14 June 2017. ^ "Nokia 6 receives over 1 million registrations on Amazon India before August 23 sale". 10 August 2017. ^ Widiartanto, Yoga. "Pabrik "Smartphone" Nokia Resmi Beroperasi di Batam - Kompas.com". KOMPAS.com. Kompas Cyber Media. Retrieved 16 December 2017. ^ "Nokia 6 Model Numbers and Variants (TA-1000, TA-1003, TA-1021)". Team Android. 2017-08-04. Retrieved 2017-08-19. ^ "Introducing the new Nokia 6 with Android". www.nokia.com. Retrieved 2017-08-19. ^ "Exclusive: Nokia 6 China variant gets Google Play Store support with the July update (Optional Feature)". Nokia Power User. 2017-07-10. Retrieved 2017-11-17. ^ "Nokia 6 | Nokia Phones". Nokia Phones. Retrieved 2017-08-20.